It's been a long time coming but finally my Ami and Miki are all finished. As some of you may know I had a lot of trouble with them, first of all the only metallic-pink paint I could find was this 'rose red' enamel paint. And being enamel it takes time to get the right mix of paint and thinner and then it wouldn't sit right or dry properly painted straight onto the figure and was bubbling a lot. So I had to strip it all off, paint everything with a base of acrylic silver and then start painting with the enamel, which I did and this time it worked nicely, however it takes a whole day between coats as enamel takes around 6 or more hours to dry between coats. In the end to get it the same thickness and cover all around I used about three or four coats. Having the silver as a base really helped as it meant that only a few touch ups needed to be done on the detail after the main painting, and also it meant that the pink went on well and stayed the same colour and metallic-ness all over. 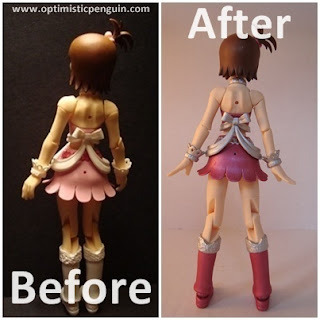 Ami Futami transformed from Strawberry Snow Edition to what I have dubbed the Brilliant Stage Edition. As you can see I changed the white to silver in most places. To create some match across the pink Brilliant Stage version's I made of Haruka and Mami I made the main part of the boots the same colour as the main colour, which in this case is metallic-pink. 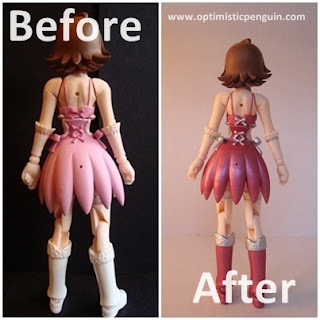 I also changed the trim from the top of her skirt from a darker pink to silver. Overall I am happy with her new colour scheme, and although the paint job is not perfect, the enamel paint tended to pick up dust really easily even after cleaning and so there are places where the paint is raised, however these don't show up much on photo's which is good. Now Miki had two shades of pink on her unlike the other Strawberry Snow Edition figures, which made customizing her more interesting. As you can see the metallic-pink I used is darker than the pink the Strawberry Snow Editions originally have, which actually turned out to be a good thing, because it meant they blended in well with the new metallic-black re-paint of the other IdolMaster's. 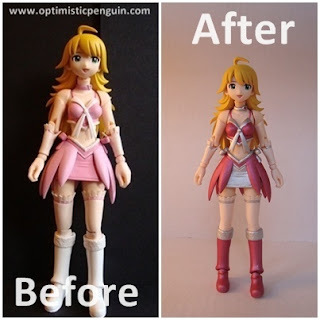 As Miki had two shades of pink to begin with I took longer on deciding her colour scheme than the other figures, I really liked Miki's original paint, more than I did the other IdolMaster figures, and so I didn't want to ruin her. However I knew that it would not be possible to have two shades of pink, as it took a long time to even find any sort of metalic-pink paint. So I went with the normal silver and pink, and just changed parts here and there. I made her necklace silver but the inside of the heart pink, which looks nice and meant that her necklace matched the other figures, as they all had the detail colour for their necklaces. I then chose to make the darker pink ribbon on her clothes the same colour as the main, making it silver would have over done the silver on her. Like Haruka I chose to make her under skirt silver, to create some unison between the two. Her boots are in the same style as the other re-paints. Her white trim is all silver and all the bows that were a dark pink I painted silver. When it came to her gloves and thigh-highs I contemplated changing them but then thought I could potentially ruin them, and so instead I just made silver ribbon run around the tops of them, which I think makes them blend into her new outfit rather well. 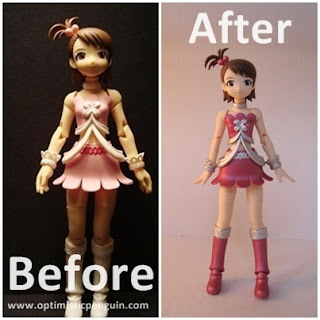 And so now all my IdolMaster re-paints are completed, and looking great if I do say so myself. Now for some close up pictures of my new custom re-paint figures.